SP-230-SS: All-Season Heated Pyranometer - Apogee Instruments, Inc. The SP-230 (All-season) is a heated pyranometer with a 0.2 W heater to keep water (liquid and frozen) off the sensor and minimize errors caused by dew, frost, rain, or snow blocking the optical path. Sensor includes IP68 marine-grade stainless-steel cable connector 30 cm from head to simplify sensor removal and replacement for maintenance and recalibration. 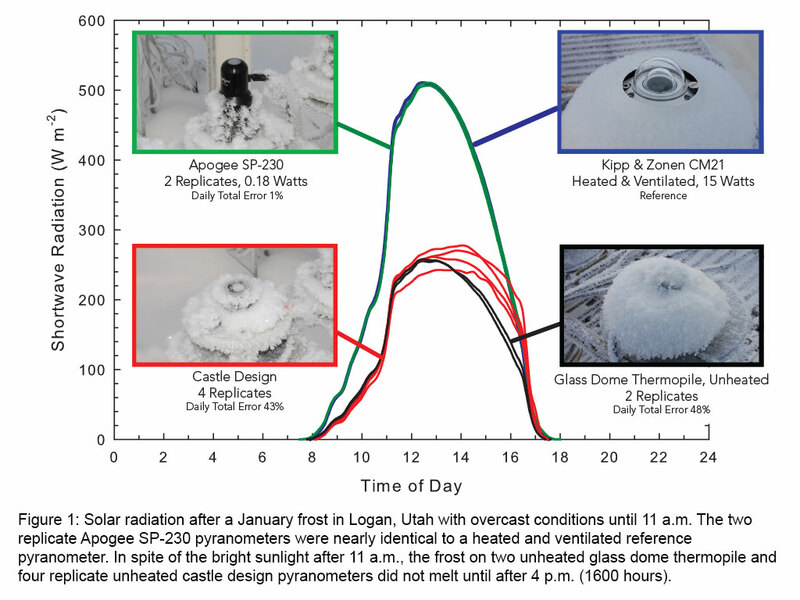 Figure 1: Solar radiation after a January frost in Logan, Utah with overcast conditions until 11 a.m. The two replicate Apogee SP-230 pyranometers were nearly identical to a heated and ventilated reference pyranometer. 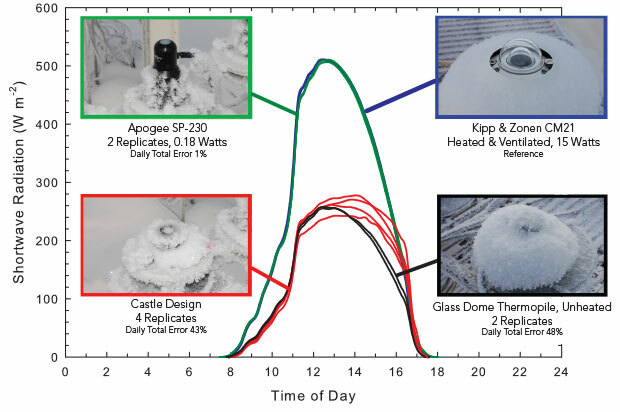 In spite of the bright sunlight after 11 a.m., the frost on two unheated glass dome thermopile and four replicate unheated castle design pyranometers did not melt until after 4 p.m. (1600 hours). Figure 2. 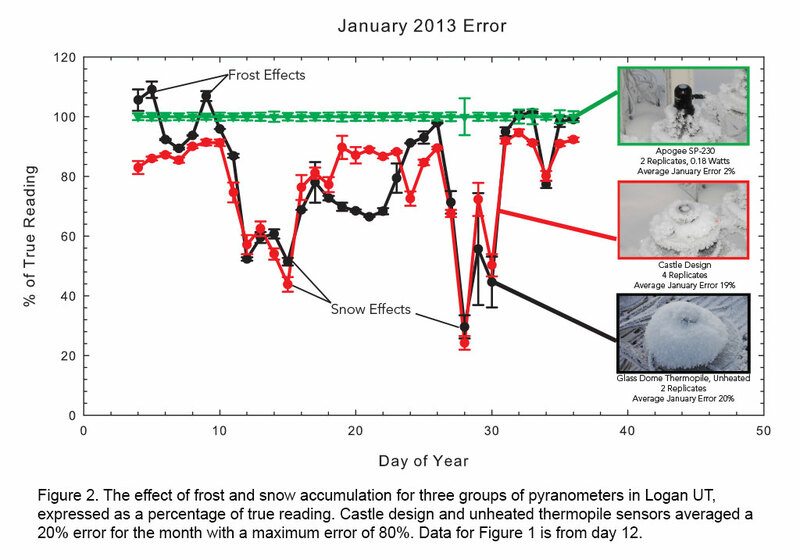 The effect of frost and snow accumulation for three groups of pyranometers in Logan UT, expressed as a percentage of true reading. Castle design and unheated thermopile sensors averaged a 20% error for the month with a maximum error of 80%. 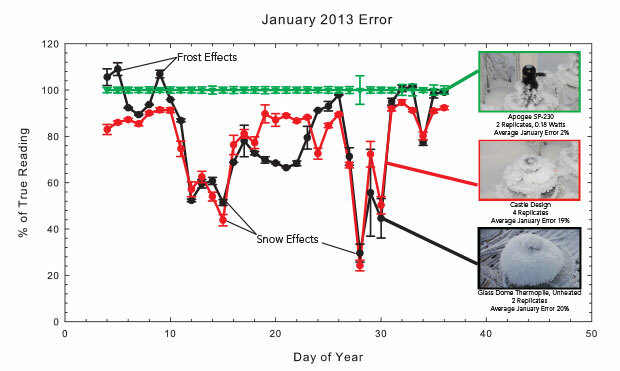 Data for Figure 1 is from day 12. SP-110's are integrated as part of a PV monitoring sytem for a PV power generation facility on the roof of the Jin Jeop library in Korea. Pyranometer mounted on model train to collect measurements in orchard for irrigation study.